By means of our experience and expertise, we bring forth a truly affordable range of the cast iron Y strainer that is best suited for high temperature and low pressure surroundings. This cast iron Y strainer is made from the quality tested cast iron material to convey the notable strength and longevity in the end product. Further, the end product is tested and assured of the leakage free performance evermore and ensures 100% efficiency. This cast Iron Y strainer manufacturer conforms to ASME standards and has proven its potency through delivering the precise filtration of the impurities and from the liquid stream flow, wherein the stainless screen of different perforation is available as per application need. The offered cast iron Y strainer has influenced the industries associated with the chemical, petroleum, power generation, water handling, etc for its efficient filtration and impeccable performance. The offered Y strainer is self operated and therefore have no possibilities of the clogging, which ultimately boosts the productivity of the end user. 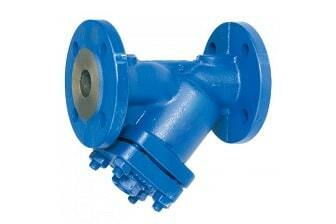 We manufacturer of this cast iron Y strainer is well versed to provide this Y strainer in the large scale of assortment, suitable to withstand 125 psi to 200 psi operating pressure and temperature up to 360° F. Our cast iron Y strainers are accredited by ASME standards and are available at local as well as international level.